It was my wife’s idea to hire Chevelle Caterers for our daughter’s sweet sixteen. We had planned a Hollywood themed party and wanted the celebrations to be really gracious. Chevelle Caterers surpassed all our expectations and the party was a huge success. Kids enjoyed the food and we enjoyed a stress-free hosting! I was given the responsibility of organizing my office’s corporate event, and I was worried that how to manage all perfectly. After doing a lot of research, I came across the website of Chevelle Caterers and found their services great, which made me, hire them. 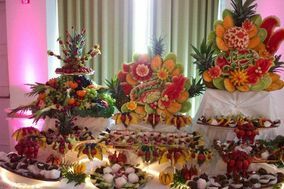 From beautiful decoration to food all have been done with perfection. They haven’t given me a single opportunity to complaint about any service. Also, I have received a token of appreciation from my boss for organizing such a grand event. I had a wonderful experience with Chevelle Caterers as I hired them for my corporate event. The team of professionals managed everything to perfection according to my requirements and within my budget. The taste of dishes they presented and served to the guests was out of the box. Chevelle Caterers worked faultlessly to make my event a big hit. Last month, we threw a party as we were blessed with a baby girl. It was a great day for us and to make it more special we hired Chevelle Caterers. The professional team has done everything to perfection from the beginning to end. They haven’t left any stone unturned, and the food they served was scrumptious. Everyone at the party loved the unique tastes and flavors of the food. Thanks guys for such a great service. Keep it up! Events come with a lot of responsibilities and duties, and I was given the responsibility to organize an office party. It was a challenging task for me as I was doing it for the first time. I discussed everything with my friend, and he recommended me Chevelle Caterers. On his recommendation, I visited their office and had a meeting with event planner Scott. He explained me about all the packages, and I found all the packages very attractive. On the day of an event, I was surprised to see such a wonderful arrangement. From stunning decoration, lighting to delicious food everything was done to perfection. All the guests at the events enjoyed a lot, and my boss appreciated to make an event a big hit. While planning our summer wedding we spoke to five different catering companies, told our requirements and budget and later finalized Chevelle Caterers. They oversaw each and every detail, answered all our queries and even made some lat minute changes on our request. Guest loved the food and hiring Chevelle Caterers turned out to be the right decision. It was great working with Chevelle Caterers. I hired them to cater us the best food station. The team of professionals worked faultlessly and set up elegant stations. My event went hit with their coordination and excellent services they provided. Everything was done to perfection, and everyone at the event loved the assorted range of food. I was given the responsibility to make arrangements for my sister’s baby shower day. There were a lot of things to do, and I was nervous that how I will do this then on my friend's recommendation, I contacted Chevelle Caterers. I had a meeting with the Scott – event planner, and he explained everything to me in detail. I finally hired him. Seriously, I was surprised to see what arrangements his team and he made. Everything from stunning decoration, lighting to food all was done with perfection. My sister thanked me for making such a great arrangement. Thanks, Scott!